The Weathermen. The Symbionese Liberation Army. The FALN. The Black Liberation Army. The names seem quaint now, when not forgotten altogether. But there was a time in America, during the 1970s, when bombings by domestic underground groups were a daily occurrence. The FBI combated these and other groups as nodes in a single revolutionary underground, dedicated to the violent overthrow of the American government. 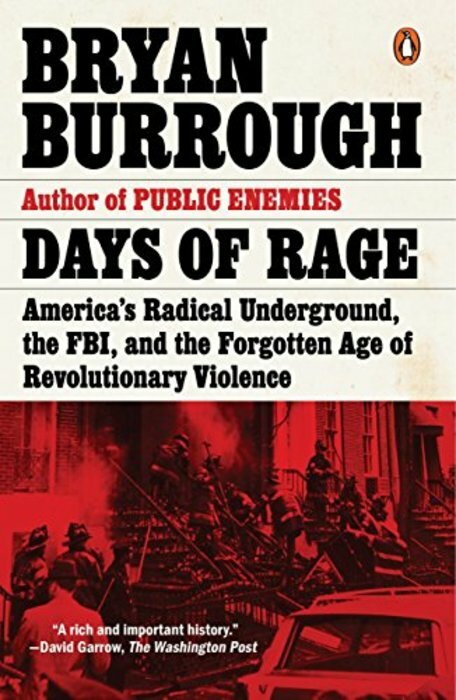 In Days of Rage, Bryan Burrough re-creates an atmosphere that seems almost unbelievable just forty years later, conjuring a time of native-born radicals, most of them “nice middle-class kids,” smuggling bombs into skyscrapers and detonating them inside the Pentagon and the U.S. Capitol, at a Boston courthouse and a Wall Street restaurant packed with lunchtime diners. The FBI’s fevered response included the formation of a secret task force called Squad 47, dedicated to hunting the groups down and rolling them up. But Squad 47 itself broke many laws in its attempts to bring the revolutionaries to justice, and its efforts ultimately ended in fiasco. Drawing on revelatory interviews with members of the underground and the FBI who speak about their experiences for the first time, Days of Rage is a mesmerizing book that takes us into the hearts and minds of homegrown terrorists and federal agents alike and weaves their stories into a spellbinding secret history of the 1970s.